Best known for her astronomical research and professorship at Vassar College, Maria Mitchell did not limit her interests to academia. A pioneer in establishing women in the sciences, she devoted a great deal of time to finding ways for women everywhere to gain greater freedom and have their rights recognized in society. In 1872 Mitchell participated in the founding of the American Association for the Advancement of Women. As described in the Association's constitution, the organization hoped "to receive and present practical methods for securing to Women higher intellectual, moral, and physical conditions." In 1875 Mitchell was elected president of the Association, a post she held for two years, presiding over their third congress of women in Syracuse and fourth congress in Philadelphia. Before the fourth congress, Mitchell also held a mid-year meeting of the Association in the Vassar observatory. 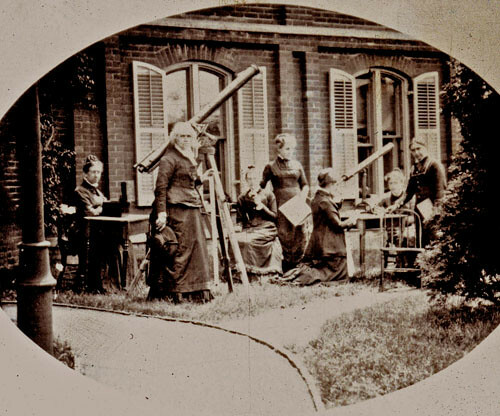 The astronomer remained active in the Association after her presidency, chairing its science committee and serving as a vice president representing New York until 1888, the year before she died. Maria Mitchell with class outside of observatory. Pictured: Harriet Stanton Blatch, Ella McCaleb. May, 1878. Until women throw off reverence for authority they will not develop. When they do this, when they come to truth through their own investigations, when doubts lead them to discovery, the truth they get will be theirs, and their minds will go on unfettered. Just as Mitchell pressed that students learned the best through deducing and observing for themselves, she advocated that women could find their voice when finally thinking for themselves. In women's education Mitchell also encouraged the teaching of self-reliance through part-time work. Most young men worked part time to pay for their education, and the education of women was proving even more expensive then men. For female students to work would both lower the cost of their education, and allow young women skills outside academia or domesticity. As Mitchell described it, for a college to "form, for any young girl, a habit of earning money," gives "her a lifelong advantage." An example of Mitchell's persistence in seeking equal treatment was her visit in 1856 to the Vatican Observatory during travels in Italy. The astronomer had anticipated visiting the observatory and meeting with Father Angelo Secchi, the Pope's scientific advisor and a pioneer in astrophysics, but, upon her arrival, she was told women were not permitted within the observatory. Mitchell was not discouraged and went to get the necessary permission through U.S. Legation to the Papal States and after two weeks of pressure she was granted permission to enter the observatory, the first woman to do so. Her admittance had no precedent, and, the first woman to join the Academy of Arts and Sciences, Mitchell was a woman to set precedents rather then to follow them.